Last friday Nifty and Bank Nifty march futures turned to positional sell mode on the hourly charts currently the resistance zone comes arround 6559 and 12269 respectively. Reverse your position to buy mode if the resistance zone breaks on the hourly charts. So far PE writers are dominating the march series right from the start of the series. However the open interest built up shows weaker position as there is no strong open interest built up. 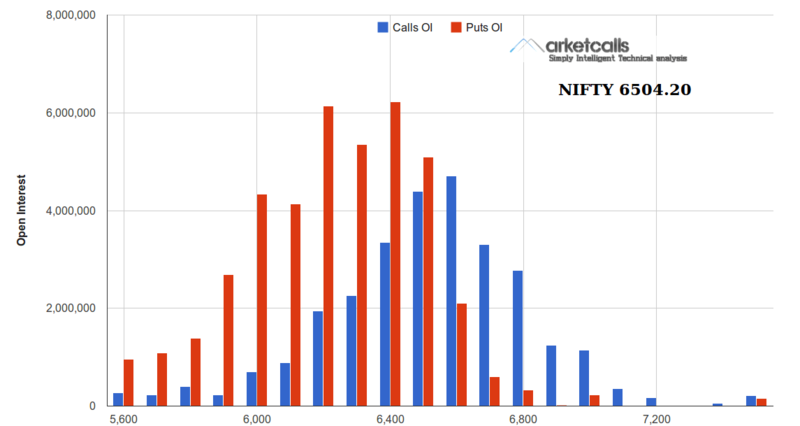 6200PE and 6400PE holds almost equal amount of open interest. And PE writers are not much confident as February 2014 option series. India’s wholesale-price index weakened to a nine-month low of +4.68% on year in February from +5.05% in January and came in below consensus of +4.9%. The falling WPI adds to declining CPI as the the Reserve Bank of India focuses on reducing inflation, with the RBI hiking interest rates three times since September. Indian consumer inflation fell for the third consecutive month, dropping to 8.1% on year in February from 8.79% in January and coming in below consensus of 8.3%. The decline comes as the Reserve Bank of India considers setting a CPI target after having raised interest rates three times since September. Meanwhile, industrial output surprisingly grew for the first time in four months, expanding 0.1% in January vs expectations for a contraction of 0.9%. Please update hourly eod chart on daily basis. I want to follow this mainly for nifty trading.